” ઉત્તર તરફની દિશા એટલે પ્રગતિની દિશા. ઉન્નતિ તે આબાદી અને અધોગતિ તે બરબાદી. સ્વર્ગ ઉપર અને નરક નીચે. ચડવામાં લાભ છે ને ઉતરવામાં નુકસાન છે. 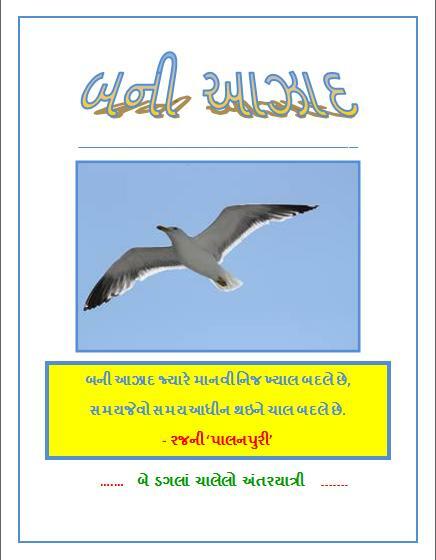 અને ઢગલાબંધ વિડિયો – અહીં …. સ્પેનીશ આંતરવિગ્રહને કારણે ઘર વિ. છૂટી ગયું. ચર્ચમાં શરણાર્થી તરીકે રહ્યા. 15 વર્ષની વયે દીક્ષા લીધી. 1973 – અમદાવાદની પોળોમાં વિહારયાત્રા આરંભી. અને પરિવારો સાથે રહીને ‘રખડતા મહેમાન’ તરીકે રહ્યા. 1999 – 74 વર્ષની વયે સ્પેનીશ- અંગ્રેજી ભાષામાં વેબસાઇટ શરુ કરી. ‘ગુજરાત સમાચાર’માં બહુ જ લોકપ્રિય નિવડેલી ચિંતનાત્મક લેખ શ્રેણી ‘નવી પેઢીને’ ના સર્જક. Spain? I am visiting Spain in May 2014, I may take a chance to meet him. I M VERY MUCH DELIGHTED SEEING YOUR EFFORT TO START A BLOG OF THIS KIND.YOUR DEDICATION IS UNIQUE AND FIRST WRITER U HAVE CHOSEN IS ALSO. KEEP IT UP. U’r Efforts r really appreciable.U r helping people like me..who always interested in Gujju stuff but dont have depth knowledge and this valuable history and other info. Now this Blog will give great Help. ફાધર વાલેસનુ ગુજરાતી ભાષા પર પ્રભુત્વ તેમ જ આપણી રોજબરોજનાં વાણી વ્યવ્હાર માટે “વાણી તેવું વર્તન” વાંચો. યુવક મિત્રો માટે “વ્યક્તિ ઘઙતર્” શ્રેષ્ઠ પુસ્તક છે. I have read both the above books & thoroughly enjoyed reading both. Father is my mentor, He was my teacher in 1960 in St.Xaviers College. When,He took his final vows,I was in the college Church as one of his student.Father Valles is very close to me and our family.When his SADACHAR book was Published one was given to my family.He Lives in Madrid,Spain but is our son of Gujarat and Father of many blessing with his living pure life.Father Valles Writes and guides others what he lives all his life. ભાષા કોઈની ઓશિયાળી નથી હોતી. એના થકી સાહિત્યકાર ઉજળો થતો હોય છે. Very nice the way you give information about Father Vales. Very useful information. I try to findout some information about him from sometime especially I want to know that website name that has been started by Father Vales in Gujarat. I have read somewhere before sometime about this site. So if you have information about that website then please also add that in this page dedicated to Father Vales. I am very pleased with this site. I will send this to Shree Father Valles. Sureshbhai-By including FATHER in this series-you have added the prestige to your blog.FATHER is a saint. My friend Mr. Devendra Peer in Philadelphia is always an instrumental to bring FATHER to USA. Only thing I m proud of,is I had made him laugh and he has read my book Sudhan-partially. મારા કોલેજકાળ દરમ્યાન એમણે મારા દરેક પત્રોના જવાબ નિયમિત આપ્યા છે. એમનું વ્યક્તિ ઘડતર પુસ્તક મારૂં એ સમયનું પ્રિય પુસ્તક હતું. એમને વંદન અને આપનો આભાર સુરેશભાઈ ! તેમના સ્વાગતનો હેવાલ .. શ્રી. ઉર્વીશ કોઠારીની કલમે.. Thanks for the blog. Congratulation on honoring Fr. Valles. TO DAY IS BIRTHDAY OF OUR DEAR FATHER VALLES AND HE COMPLETES 84 YEARS. I WOULD LIKE TO WISH HIM A VERY HAPPY BIRTHDAY AND PRAY TO ALMIGHTY TO GRANT HIM MORE AND MORE STRENGTH DAY BY DAY TO FULFILL ALL HIS FUTURE PLANS WHICH ARE FOR THE UPLIFTMENT OF PEOPLE LIKE US WHO ACCEPT DEFEAT SO MANY TIMES IN A DAY. I WOULD LIKE TO SEND AN EMAIL DIRECTLY TO HIM IF SOMEONE CAN SEND ME HIS EMAIL ID. I AM LONGING TO RECEIVE HIS BLESSINGS IN GUJRATI. I RESIDE IN GOA AND HAVE MET FATHER VALLES THREE TIMES TILL DATE. I HAVE INVITED HIM TO GOA TO VISIT THE CHURCH OF ST. FRANCIS XAVIER WHEREIN THE BODY IS STILL KEPT. BUT IN HIS BUSY SCHEDULE HE COULD NOT FIND TIME TO VISIT GOA. I STILL HOPE THAT ONE DAY HE WILL COME TO GOA AND I WILL MEET HIM AND TAKE HIM AROUND. GOOD WISHES TO ALL THE LOVERS OF FATHR VALLES AND LET US SOME TIME MEET. there was an error in my email id in the earlier comment which please note. Father Valles email contact carlos@carlosvalles.com ! I would like to know if the books published are available in Amdavad, Gujarat…Please suggest bookstores/publishers names. Pl. check out for Father Valles’ books. Check out his own website If you have any Q. pl. email me direct.Have Great NY. કાર્લોસ જોસે વાલેસ, ‘ફાધર વાલેસ’ (૪-૧૧-૧૯૨૫): નિબંધકાર. જન્મ સ્પેનના લોગ્રોનોમાં. ૧૯૪૧માં એસ.એસ.સી. ૧૯૪૫માં સલામાન્કા યુનિવર્સિટીમાંથી ગ્રીક વિષય સાથે બી.એ. ૧૯૪૯માં ગ્રેગોરિયન યુનિવર્સિટીમાંથી તત્ત્વજ્ઞાન વિષય સાથે બી.એ. ૧૯૫૩માં મદ્રાસ યુનિવર્સિટીમાંથી ગણિતશાસ્ત્ર વિષયમાં એમ.એ. ૧૯૬૦થી ૧૯૮૨ સુધી સેન્ટ ઝેવિયર્સ કૉલેજ, અમદાવાદમાં ગણિતશાસ્ત્રના અધ્યાપક. ૧૯૬૬માં કુમારચંદ્રક અને ૧૯૭૮માં રણજિતરામ સુવર્ણચંદ્રક. એમના ચિંતનાત્મક નિબંધોમાં મુખ્યત્વે જીવનઘડતર અને સંસ્કાર ઘડતરનું લક્ષ્ય હોય છે. ‘ગુજરાત સમાચાર’માં આવતી ‘નવી પેઢીને’ ખૂબ લોકપ્રિય બની હતી. સરલ ગદ્યમાં અનોખી અભિવ્યક્તિઓ એમના લખાણની વિશેષતા છે. આ સિવાય ઘણા પુસ્તકો છે તે પણ વાંચજો . ‘જ્ઞાન જ્યોત’ના ઉપક્રમે અમદાવાદમાં યોજાયેલ જ્ઞાનોત્સવમાં ગુજરાતના ઘર-ઘરમાં જ્ઞાનની પ્રતિષ્ઠાનો ચિરંજીવ સંદેશો પહોંચાડવા મુખ્યમંત્રી નરેન્દ્ર મોદીએ ‘વાંચે ગુજરાત’ નામના નવતર મહાઅભિયાનની જાહેરાત કરી છે. જેનો આંરભ ર્સ્વિણમ જયંતી વર્ષ ૨૦૧૦-૧૧ દરમિયાન સમગ્ર રાજ્યમાં થશે. ગુજરાત સુવર્ણજયંતી અવસરે ૫૦ પુસ્તકો વસાવીને પ્રત્યેક પરિવાર ગ્રંથાલય ઊભું કરવાનો સંકલ્પ કરે અને વર્ષ દરમિયાન ૫૦ લાખ પરિવારો જ્ઞાનમાર્ગના વાંચક- યાત્રિક બને. આપ સૌ પણ આ અભિયાનમાં આપના બ્લોગ ધ્વારા જોડાવા વિનંતી. આપ પણ આ સંકલ્પમાં, અભિયાન માં જોડવો. “My Gujarati books have to be ordered from Gurjar Sahitya Bhavan, Opposite Ratan Pole, Gandhi Road, Ahmedabad 380 001, India. My English books from Gujarat Sahitya Prakash, P.O. Box 70, Anand, (Gujarat), 388 001, India. I hope you can get them. Father is my mentor, He was my teacher in 1960 in St.Xaviers College. When,He took his final vows,I was in the college Church as one of his student. Father Valles is very close to our family. When his SADACHAR book was Published one was given to our family. Now, He Lives in Madrid,Spain but Father is Gujarati and “Son of Gujarat” too. Father’s blessing and his living pure life will guide many on the path of true liberation of life. If I am not mistaken, people of Gujarat welcomed and showered their love whole heartedly on Father Valles by calling him “SAVAYA GUJARATI” for his contribution towards Gujarati literature which is apt and none but he deserves it. I used to read Fr.valles’s motivational articls. I was a student at st.Xavier’s college in 1958-59. In Gujarat, this was the only college that had an English medium class. Reading Fr.Valles’s Bio, brought back a flood of memories of my two year spent at this college and hostel. Let me wish Fr. Valles a long life;as a person of God,we live with his blessings. thank you father vales for reading and taking actions on my mails. ek father,ek spanish father,father rade father hase,ek moti chokri,ek naani chokri,tapaal lakhe,you are my best friend. dear father i heartly regards for you as a savaya gujarati.for contribution towards gujarati literature. Happy Birth Day …… May God showers His blessings on you today (the luckiest day) & forever. We (Alka Joshi , Family & Friends – Rakot) pray God for your good health , peace & prosperity. You get all what ever is in favour of you & whatever you wish. i salute father,no more word i have. for me father wallace is the best author and philosopher of human life for any country,any language and in any era. No body is comparable to father wallace, even no body can come near t o him, he is and will be great writer in gujarati language forever, i think he deserves all the award of lieterature of the world. he is simply great,great,great,great and great writer and human being for years to come………..
father walleas. we love you so much and miss u so much. pls. come back to gujarat. Great inspiring life dear fr Vales. ફાધર વાલેસ જન્મ્યા વિદેશમાં અન ક્રમે બન્યા ગરવા ગુજરાતી . તેઓ પ્રતિભાવંત ગુજરાતી -સવાયા ગુજરાતી છે. Good job sir…thank u so much..
🙏 યુવાનીના શરૂઆતના વર્ષોમાં ફાધર વાલેસ સાથેના નિયમીત પત્રવ્યવહાર થકી મારા ઘડતરમાં એમનો ઘણો ફાળો માનું છું. એમના લખાણોની પણ બહુ ઊંડી અસર મેં અનુભવી છે.